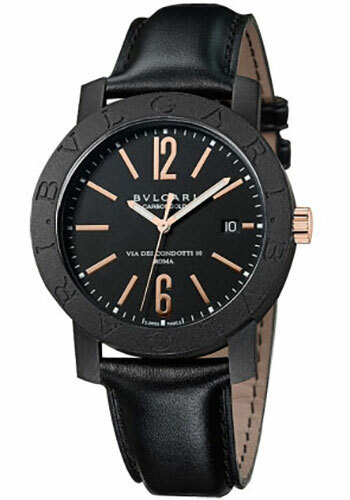 40 mm carbon fiber case, 18-ct pink gold crown, black carbon bezel with Bulgari logo, sapphire crystal, black dial, automatic movement, approximately 42 hours of power reserve, black calfskin strap, tang buckle. Water resistant to 100 ft.
40mm carbon and gold case, transparent back, 18K pink gold crown, black dial, B077 automatic movement with date, hour minute, seconds functions, approximately 42 hours of power reserve, woven leather strap, ardillon buckle. 40mm carbon and gold case, transparent back, 18K pink gold crown, brown dial, B077 automatic movement with date, hour minute, seconds functions, approximately 42 hours of power reserve, woven leather strap, ardillon buckle. 40mm carbon and gold case, transparent back, 18K pink gold crown, blue dial, B077 automatic movement with date, hour minute, seconds functions, approximately 42 hours of power reserve, woven leather strap, ardillon buckle.